This is your chance to explore a variety of the best Belgian beers. Each month showcases a different style with a selection of top-rated beers -- each from a different brewery! Immediately, we send a Welcome Packet. 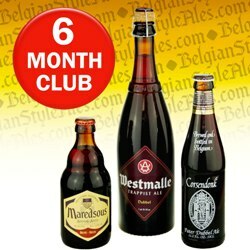 It includes a list of the months to be received, information about all styles of Belgian beer, and a "Rate it Yourself" worksheet to help keep track of the beers received and rate them. Beer shipments begin the month after the order is placed. To delay the start, purchaser can indicate the start month in the "Special Instructions" field during Checkout. Shipments go out the first Monday of each month. Automatically, the recipient will receive consecutive monthly shipments, featuring the style of the month. One large (25.4 oz.) and two small (11.2 oz.) bottles each month -- all from different breweries that showcase the style of the month. Monthly flyer describing each beer in the shipment -- including primary characteristics, brewer information, and the tradition behind the style.